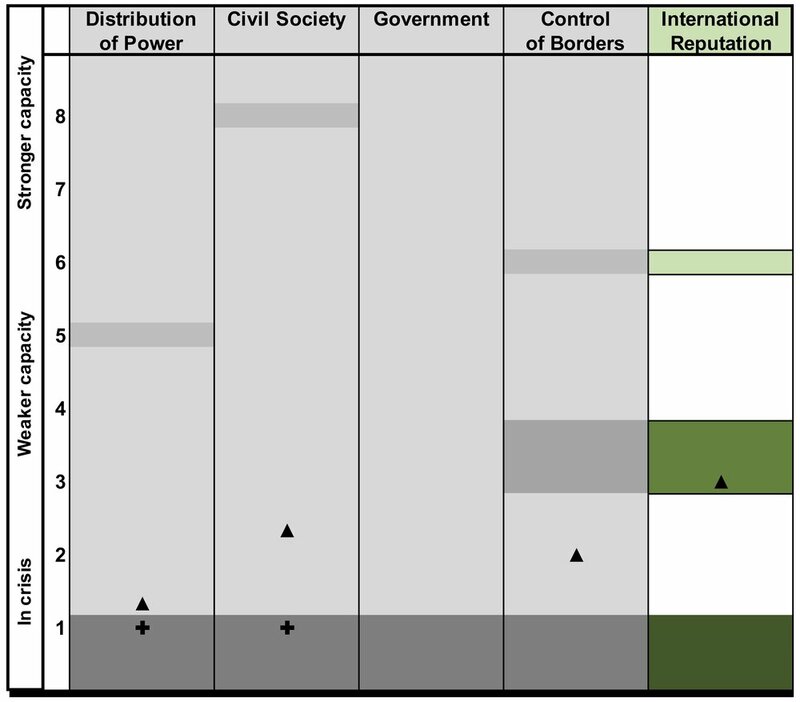 In the chart below, 5 dimensions of Syria’s capacity to govern itself are shown, from left (“Distribution of Power”) to right (“International Reputation”). Taken together, the 5 dimensions of the x-axis offer a comprehensive, holistic view of Syria’s capacity to govern itself. International Reputation is important because outside investment—whether from private capital markets; multilateral organizations like the World Bank; development funds like UNDP, DFID, or USAID; foundation-backed NGOs; independent businesses; or Syria expats—depends heavily on reputation. The better Syria's international reputation, the more freedom the country will have to solve existential threats. 5. Neutral with most countries, positive with some. 4. Neutral with most countries, negative with some. 2. Negative with most countries, neutral with some. 25 prime actors participated in determining the ability of Syria to respond to existential threats based on its current international reputation. Positive with most countries, negative with some. Neutral with most countries, mostly negative with others. "Syria has client-type relations with Iran and Russia. ("232272)"